Tipard Blu-ray to PS3 Ripper is a useful and comprehensive software, which can help you easily rip Blu-ray to PS3 format. Besides, it allows you to convert any popular video and DVD to PS3. This perfect software also has powerful editing functions, like trimming, cropping and merging Video effect. What's more, it highly supports iPhone5, iPod Touch5, iPod Nano7, Samsung Galaxy S4 and Kindle Fire HD now. 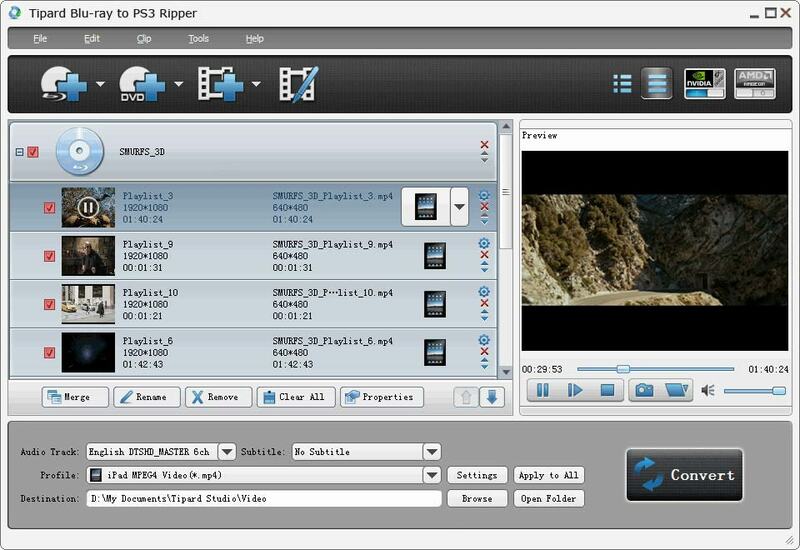 This Tipard Blu-ray to PS3 Ripper software has the function of ripping Blu-ray to PS3 format. And it is able to convert any popular video and DVD to PS3. With this crop function, it can cut off black edges and unwanted playing area and choose your preferred image Aspect Ratio to fit your portable devices. Trim any segment of a Blu-ray movie by setting its start and end time or just dragging the slide bar. Add a text/image watermark to the source video. Also you can set its position and transparency. Tipard Blu-ray to PS3 Ripper enables you to adjust video effect: Brightness, Contrast, and Saturation. And the “Deinterlacing” function can help you improve the video quality by converting the interlaced video to a progressive one. This perfect software allows you to preview the original video and output video effect simultaneously. And you are available to capture favorite picture when you preview. Tipard Blu-ray to MPEG Ripper (Popularity: ) : Tipard Blu-ray to MPEG Ripper do well in ripping Blu-ray movie/DVD/video formats to MPEG and other popular video formats, including H.264/MPEG-4 AVC, AVI, VOB, MPG, FLV, MP4, WMV, etc.